Happy Friday and the the first day of #16 Inky Paws Challenge! 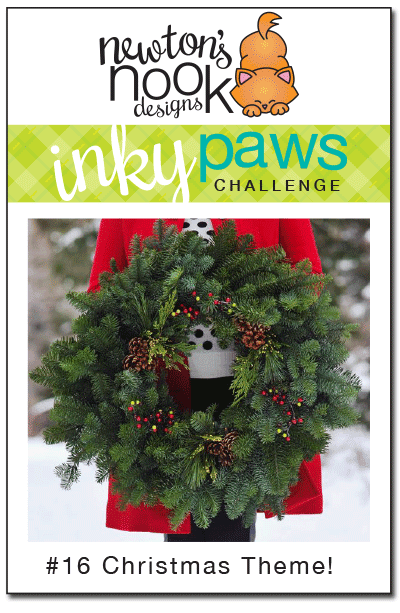 This month's challenge is to a Create a project with a Christmas Theme! Since this challenge falls over a holiday weekend we decided to give a little extra time - you have three weeks to play along instead of the usual two. Deadline to enter is Friday, December 12th, 2014 at Midnight CST. The winners will be announced on the NND blog on Monday, November 15th. Post your project to your blog or to an online photo gallery such as Flickr , Pinterest, or splitcoaststampers (on splitcoast please use keywords newtonsnook and IPC16). Several of our Design Team Members decided to play along - Scroll down to see all their adorable Holiday creations and then enter your project at the bottom of the post! Read the description below each card to see who made it! 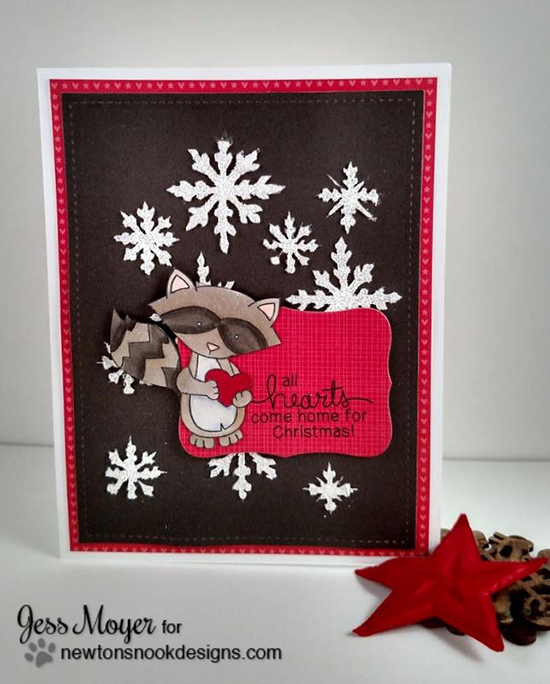 Our guest designer for November Donna Mikasa decided to play along with this adorable card using our Winter Tails stamp set. She changed the snowball that Winston is rolling on into a pretty ornament! Such a fun idea! I love the fun shape of this card too! 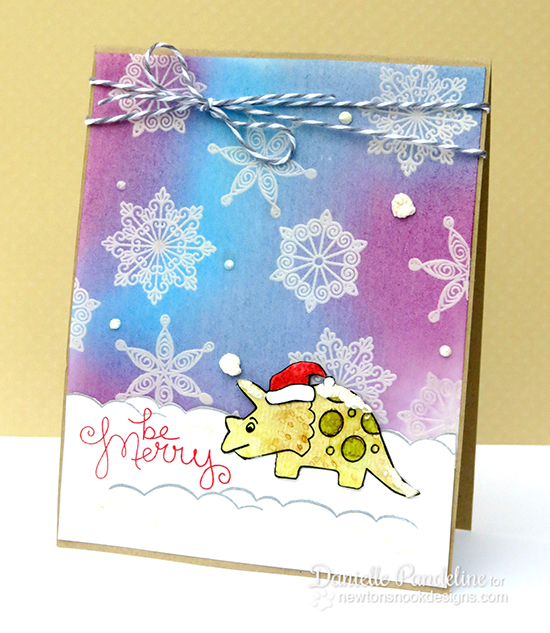 Tessa created this adorable card using the little crab and "joy" stamps from the SEAson's Greetings stamp set! I love the layered tags and little staples as decoration! 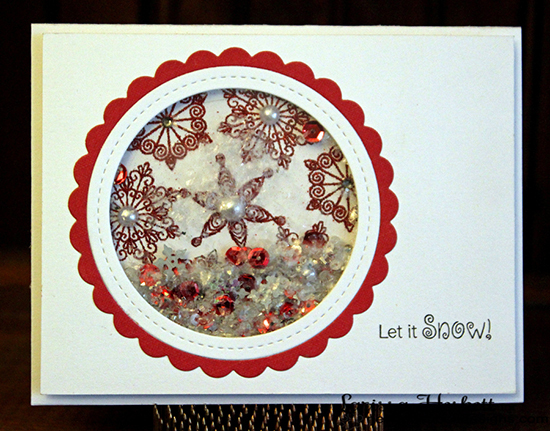 Larissa created this Gorgeous Christmas shaker card using our new Beautiful Blizzard stamp set. I love the red and white combo - reminds me of holiday peppermints! 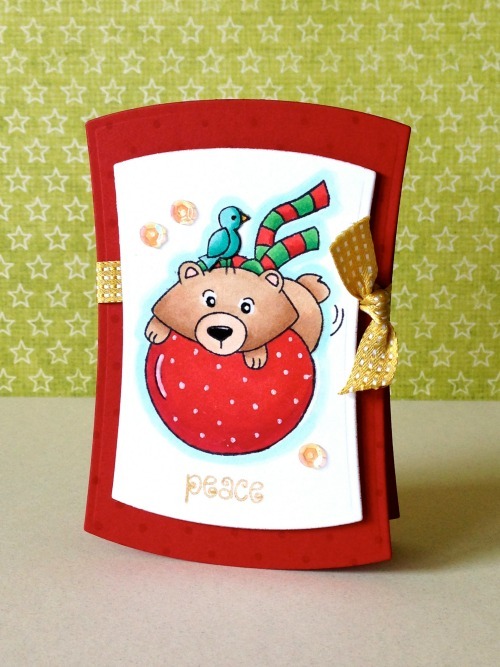 Jess created this adorable card using our Sweetheart Tails stamp set with the sentiment fromWinston's Home for Christmas . I love that she used a "love/Valentine" set and made it work for Christmas! What a great way to get more milage out of your stamps! 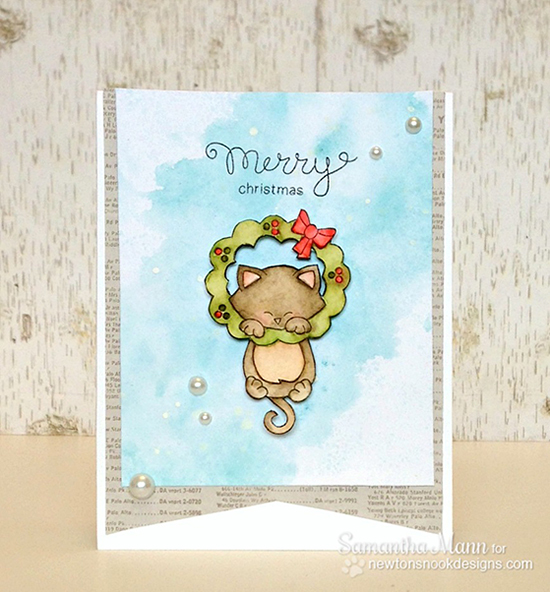 Samantha created this lovely watercolored Christmas card using the cute kitty in the wreath from the Newton's Holiday Mischief set. The "merry"& "Christmas" stamps are the Holiday Wishes stamp set. 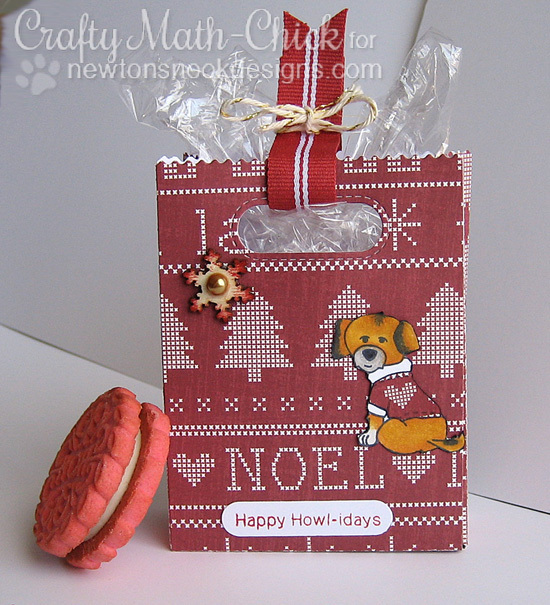 Crafty Math-Chick created this fun doggie Holiday Treat Bag using the cute pup in sweater from the Canine Christmas stamp set! So cute how she matched the sweater on the pup with the background paper! Here's one by me - I used the girl and guy snowmen from the Flaky Family set - stamped on Kraft colored card stock so I could color them white. 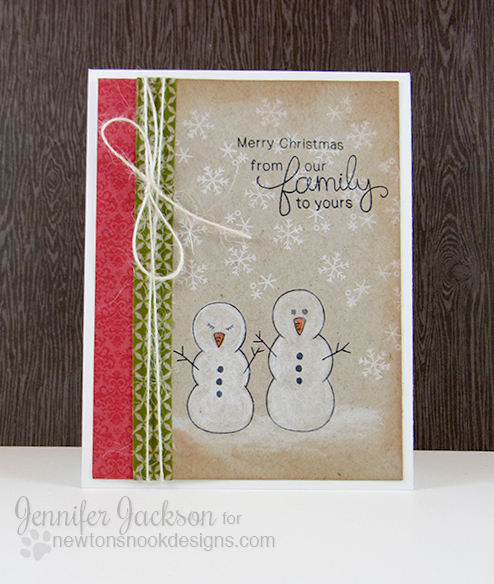 I also added a bunch of snowflakes in white ink and the "Merry Christmas from our Family to yours" sentiment! Now it's your turn - we can't wait to see your holiday creations!